Why Does My Bike Keep Blowing Headlight Bulbs? Why does the CT110 need a Voltage Regulator? The CT110 has a unique electrical system, for sure. save the filament automatically as engine speed increases, burning off the excess Voltage as heat. giving it part number 6VACRMB. On all CT110 models, the headlight and high beam indicator lamp are powered by AC, directly from a stator winding. On all CT110 models, the ignition is powered by a separate winding in the stator. The first two year models have points and condenser ignition powered by AC. Somewhere in the ’83 production run Honda installed CDI ignition, also powered by AC from a separate stator winding. The dash and neutral lamps, blinkers and indicator, stop/tail lamp, and horn are all powered by switched, fused power from the battery. A single winding from the stator charges the battery through a half-wave rectifier. and the charging system involves a more complex rectifier and stator coil switching arrangement. Quite often at some point in the life of the bike, the AC headlight Voltage goes way up. This problem seems to be located in the stator itself, manifesting as too-high headlight Voltage just above idle. The bike will blow headlight bulb filaments quickly. Changing the stator is not only costly, but the overVolt problem typically re-occurs. 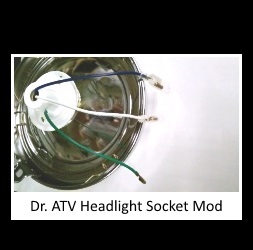 I designed and developed a special Voltage regulator for the CT110 headlight overVolt problem. Mel figured out it would fit in the headlight bucket, and the Pardue Brothers manufacture and stock it under part number 6VACRMB. The device is solidly built in a weatherproof housing, with Honda plug-in connectors and color-coded wiring for a simple and quick fix. Pardue Brothers currently ships USPS Flat Rate Priority Mail to the USA, Canada, Australia, United Kingdom, Malta, Republic of Ireland and New Zealand. Do You Make Parts for My 6Volt Bike? Pardue Brothers can make parts for other 6Volt motorcycles that are not listed here. We do not sell generic parts. Every part we make is custom made with the correct wire colors, length and instructions for your bike. We will work with you to create a solution for your bike if you can provide us the details we need. I just ordered a new regulator....do I need a rectifier too? Do I have a Full Wave or 1/2 Wave Rectfier? This is a question that requires some details about your bike. Please contact Jon Pardue at the contact page Here so he can help you with it. Where are the documents I ordered? Documents will be delivered directly to your email. They are not instant downloads. Jon checks every document, personalizes them with your name, and updates with any new information before he sends them. Document orders are shipped within 24 hours and usually sooner.